Oil on cardboard, 22 x 12 cm. A proud father in Italian garb lifts his infant child while looking into its eyes. 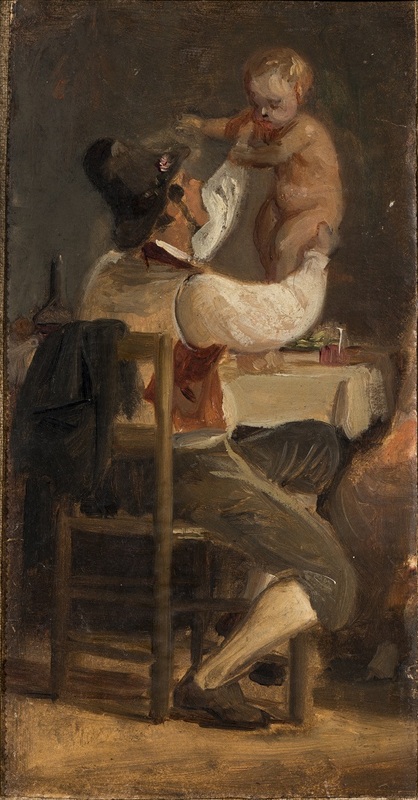 The painting is an intimate portrayal of the love between father and child and a prestudy for a later work with the same title. At the heart of the subject is the child’s harmonious attachment to its father, which is in accordance with Wilhelm’s view of the ideal family. In 1840, Marstrand wrote a letter to his brother Osvald where he expressed his views on the role of family in society: “I remain convinced that a man’s enterprise and work in society has its source in the home, from whence it finds nourishment and ripens.” Marstrand therefore believed that the individual would only be able to truly achieve his potential for the benefit of society if he had a harmonious and supportive family at home.